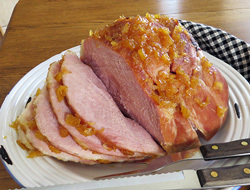 Simple baked ham with a sweet glaze. 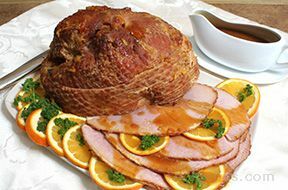 This ham is baked just long enough to enhance its flavor and the pineapple glaze adds that extra special touch. Trim off any skin from the ham and trim fat to 1/4 inch. Place the ham on a rack in a roasting pan. Add 1 cup of water to the pan. Cover with foil. Place in the preheated oven and bake for approximately 20 minutes per pound. Watch carefully and remove ham from the oven when it reaches 135° F. when check with thermometer. Do not overcook. While the ham is baking, mix all the glaze ingredients and cook over medium heat stirring constantly until thickens and boils. Boil 1 minute. 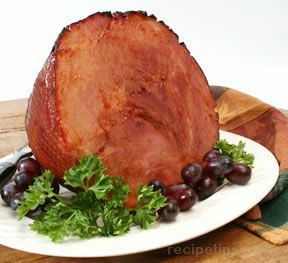 Remove the foil and apply glaze to ham during the last 30 minutes of baking time. 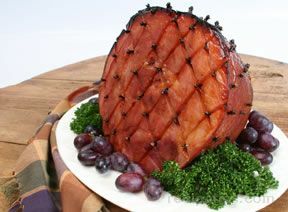 "I couldn't make it home for Easter so I baked this ham for myself and a couple of my friends. I even bought an instant read thermometer to check the temperature of the ham when it was cooking. It turned out great. We loved the pineapple glaze on it. It didn't give the ham itself extra flavor but it tasted great with the ham. I was pleased with my first attempt at cooking a ham."